The 1995 American League West tie-breaker game was a one-game extension to Major League Baseball's (MLB) 1995 regular season, played between the California Angels and Seattle Mariners to determine the winner of the American League's (AL) West Division. 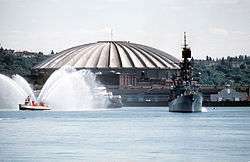 The game was played on October 2, 1995, at the Kingdome in Seattle, Washington. The game was necessary after both teams finished the strike-shortened 144-game season with identical win–loss records of 78–66. Seattle won the game by a score of 9–1, securing its first postseason berth in franchise history. It was counted as the 145th regular season game for both teams, with all events in the game added to regular season statistics. The game matched two highly unlikely teams: the Angels had not been to the postseason since 1986, and had not finished above third place in the AL West since. On the other hand, the Mariners had never been to the postseason, and before 1995 only had two seasons with a winning percentage above .500. With less than two months left in the 1995 regular season, the Angels held a comfortable lead in the AL West standings, 11 games ahead of the second-place Texas Rangers and 13 games ahead of the third-place Mariners. However, the Mariners mounted a late-season comeback, coupled with a late-season collapse by the Angels, to force the tie-breaker. After winning the tie-breaker, the Mariners advanced to play the New York Yankees in the AL Division Series. They won the series in five games on an 11th-inning double by Edgar Martínez in Game 5. After advancing to the AL League Championship Series, they lost to the Cleveland Indians in six games. The Angels, meanwhile, did not earn a trip to the postseason until 2002. As per normal MLB practice at the time, the home team for this game was determined by a series of coin tosses held on September 18 to determine home teams for all potential one-game tiebreakers. All statistics compiled during the game were added to each player's and/or team's regular season statistics. The game was nationally televised on ESPN with Jon Miller and Joe Morgan making the call. The first six innings of the game were largely a pitchers' duel between Seattle staff ace Randy Johnson and California's Mark Langston, the Mariners' former staff ace who was traded to Montreal for Johnson in 1989. Seattle put runners in scoring position in the first and fifth innings, but only scored one run in the fifth when Dan Wilson scored on a single by Vince Coleman. Johnson was perfect—that is, he allowed no runners to reach base—until the 6th inning when Rex Hudler singled but was stranded at second base. In the seventh inning, Langston allowed a single to Mike Blowers, then allowed Tino Martinez on base via fielder's choice, then hit Joey Cora to load the bases with two outs. Luis Sojo followed with a double to right field that glanced off of first baseman J. T. Snow's glove and rolled under the Angels' bullpen bench, scoring Blowers, Martinez, and Cora. Sojo himself scored on the play as a result of Langston's throwing error, and Langston was replaced by relief pitcher Bob Patterson. Now trailing by five runs, the Angels threatened again in the 8th inning with runners on second and third, but Hudler grounded out to end the threat. In the bottom of the 8th, the Mariners again had the bases loaded when Tino Martinez singled to score Edgar Martínez, followed by a Dan Wilson double that scored Jay Buhner and Blowers, and finally a sacrifice fly double play hit by Cora that scored Tino Martinez but got Wilson thrown out at third. Tony Phillips led off the 9th for the Angels with a home run to avoid a shutout, but Johnson retired the next three Angels hitters to record his sixth complete game and 18th win of the season. Both teams entered the tiebreaker with long histories of frustration and disappointment. California had won the AL West division title on 3 occasions (1979, 1982, and 1986), but failed to advance to the World Series each time. In particular, the Angels blew a 2–0 series lead in the best-of-five 1982 ALCS to the Milwaukee Brewers, and were one strike away from defeating the Boston Red Sox in Game 5 of the 1986 ALCS but ended up losing that game and the next two to lose the best-of-seven series that they had led 3–1. They had not returned to the postseason since the 1986 loss. Seattle, on the other hand, had only had two winning seasons since the franchise began play in 1977 (1991 and 1993), and had never been to the postseason. The team had gone through three ownership changes in its first 15 years, its most recent coming in 1992 when a consortium led by Hiroshi Yamauchi, which owns the Mariners to the present day, bought the team from Jeff Smulyan, who had threatened to relocate the team as a consequence of its losing ways. As a consequence of the 1994–95 Major League Baseball strike, the 1995 season started on April 25, and was shortened to 144 games instead of the normal 162. California took an early lead in the AL West standings and traded first place with Texas through May and June. They took the lead on July 2, and held on to that lead throughout the rest of July and all of August. Seattle, meanwhile, spent most of June through August in third or fourth place. They would bottom out on August 2, 13 games out of first place. The Angels' fortunes began to change when they were swept by Boston from August 21–23, then after winning one game over Baltimore, went into a 9-game losing streak beginning August 25. Seattle had an August record of 16–13 (.552), while California had an August record of 13–17 (.433). Seattle took second place on September 2, with Texas in a losing streak it would never recover from. Then in September, California went into a second 9-game skid from September 13–23, allowing Seattle to take first place on September 22 in the middle of their own 7-game winning streak. California sank to 3 games out of first place with 5 games left in the season, but won those last 5 games—including a 4-game sweep of the Oakland Athletics—while Seattle lost 3 of their last 5 games, forcing the tiebreaker. The Angels' defeat in the tiebreaker marked a continuation of the team's struggles at the time. It was the closest the Angels would come to reaching the postseason during their playoff drought that lasted from 1986 to 2002, when they won the AL Wild Card and ultimately the World Series. The game was a stepping stone in what is widely regarded in Seattle as the most memorable season in Mariners franchise history. Having secured their first ever postseason berth, the Mariners went on to play the New York Yankees in the first American League Division Series played under the present-day format. They would defeat the Yankees in Game 5 of the ALDS, on the heels of Edgar Martínez' game-winning double, but ultimately were defeated by the Cleveland Indians in the American League Championship Series. The game marked the beginning of the most successful era in Seattle franchise history, as they would go on to win AL West division championships again in 1997 and 2001, and an AL Wild Card berth in 2000. However, they failed to reach the World Series each time and remain one of two MLB franchises to never reach the Fall Classic, along with the Washington Nationals. Off the field, the Mariners' AL West championship as well as its memorable run in the postseason served as a catalyst for public funding for a new ballpark. 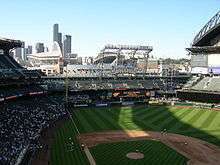 Less than two weeks before the tiebreaker, the residents of King County, Washington (whose county seat is Seattle) voted against a sales tax increase to fund a new stadium, but shortly after their ALDS victory, the Washington State Legislature reconvened and approved a separate funding package for a new stadium. The new stadium, now called Safeco Field, opened in July 1999. The two franchises' fortunes were reversed beginning in 2002 and continuing to the present day, as the Angels rose to the most successful era in their history by winning the aforementioned World Series and five division titles while the Mariners returned to the bottom of the division standings for most of those years (the only exceptions being in 2002 and 2009, when they finished a close third and 2003 and 2007, when they finished second). 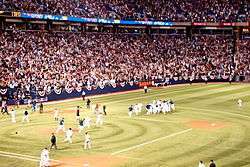 This game is also notable in that the storming of the field by Mariners fans following the recording of the last out represents the most recent major field invasion by team fans reacting to a victory. ↑ Finnigan, Bob (1995-10-02). "Playoff Awakens Memories For Piniella – M's Manager Watches After Playing In '78". The Seattle Times. Retrieved 2009-04-28. 1 2 3 4 "Los Angeles Angels of Anaheim Team History & Encyclopedia". Baseball-Reference.com. Archived from the original on 28 February 2009. Retrieved 2009-03-27. 1 2 3 4 5 "Seattle Mariners Team History & Encyclopedia". Baseball-Reference.com. Archived from the original on 14 February 2009. Retrieved 2009-03-27. 1 2 "1995 Texas Rangers Schedule, Box Scores, and Splits". BaseballReference.com. Retrieved 2009-03-27. 1 2 3 4 "1995 Seattle Mariners Schedule, Box Scores and Splits". BaseballReference.com. Retrieved 2009-03-27. ↑ Major League Baseball official press release (2009-01-15). "Ownership approves two major rules amendments". MLB.com. Archived from the original on 21 February 2009. Retrieved 2009-03-27. ↑ "Historical Standings – Monday, Oct 2, 1995". Baseball-Reference.com. Retrieved 2009-03-27. 1 2 3 Finnigan, Bob (1995-10-03). "Emotional Playoff Win For Al West Title Melts Away Franchise's Years Of Frustration". The Seattle Times. Retrieved 2009-04-27. 1 2 3 4 5 6 7 "October 2, 1995 California Angels at Seattle Mariners Box Score and Play by Play". Baseball-Reference.com. Retrieved 2009-03-27. ↑ "Randy Johnson Statistics". Baseball-Reference.com. 2009-02-10. Archived from the original on 10 February 2009. Retrieved 2009-03-27. ↑ "1982 AL Championship Series – MIL vs. CAL". Baseball-Reference.com. Archived from the original on 9 March 2009. Retrieved 2009-03-27. ↑ "1986 AL Championship Series – BOS vs. CAL". Baseball-Reference.com. Archived from the original on 12 April 2009. Retrieved 2009-03-27. ↑ "BaseballAmerica.com Executive Database: Jeff Smulyan". Baseball America. Retrieved 2009-03-27. 1 2 3 "1995 California Angels Schedule, Box Scores and Splits". Baseball-Reference.com. Retrieved 2009-03-27. ↑ Kettmann, Steve (1995-10-02). "Angels Redeem Themselves". San Francisco Chronicle. Retrieved 2009-04-28. ↑ Kelley, Steve (2009-03-02). "How John Wetteland helped save baseball in Seattle". The Seattle Times. Archived from the original on 6 April 2009. Retrieved 2009-03-27. 1 2 "1995 AL Division Series – SEA vs. NYY". Baseball-Reference.com. Archived from the original on 10 February 2009. Retrieved 2009-03-25. ↑ "1995 AL Championship Series – CLE vs. SEA". Baseball-Reference.com. Archived from the original on 23 April 2009. Retrieved 2009-03-27. ↑ "Postseason Index". Baseball-Reference.com. Archived from the original on 12 April 2009. Retrieved 2009-03-27.